UK retail sales grew for the 29th month in September, partly due to the Rugby World Cup. Sales in the month grew 6.5% from the same month of 2014, the Office for National Statistics (ONS) estimated. The period covered was actually 30 August to 3 October, which means it includes the bank holiday weekend at the end of August. But the ONS said that the effect of the bank holiday had been removed by seasonal adjustment. September 2014 figures did not include the bank holiday weekend. 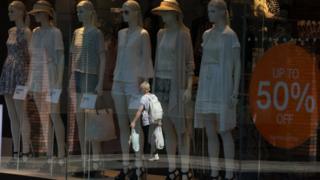 The quantity bought in the retail industry grew 1.9% last month compared with August. "Falling in-store prices and promotions around the Rugby World Cup are likely to be the main factors why the quantity bought in the retail sector increased in September at the fastest monthly rate seen since December 2013," said Kate Davies head of retail sales at the ONS. Average shop prices including petrol stations were 3.6% lower in September than they had been a year earlier. The bank holiday applied in England, Wales and Northern Ireland. An earlier version of this story suggested that the rise in retail sales was due to the timing of the bank holiday weekend, but the ONS has now clarified that seasonal adjustment would have removed that effect.